This is a house that is for sale in California - you can see their listing here. I don't own these pictures, clearly. While not EXACTLY like my space, it is pretty durn close and provides an excellent idea for me in exploring our renovation plans. We've got painted wood panelling in the kitchen instead of beadboard, but close enough. This wall with the sink is pretty much spot on what our wall there looks like. The banquette seating is where ours will be if we go that route except no bay window and where that door is would be a window. 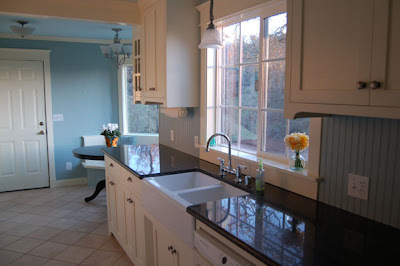 Also, I love the farm sink in the picture with the dark granite counters. Ahh..
From this picture you can see more of the kitchen. Where the door to their den is in the picture is where our pantry is. The fridge is where theirs is, just turned to face towards the kitchen because we've got a door to the dining room where the fridge cabinet is. 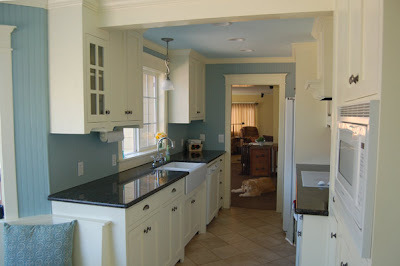 This picture shows well the idea I had of narrower built in cabinets - except ours would be on the opposite wall, in between the kitchen and the banquette. The built ins have to be narrower than actual cabinets because the wall actually comes in a bit at the break in the kitchen. 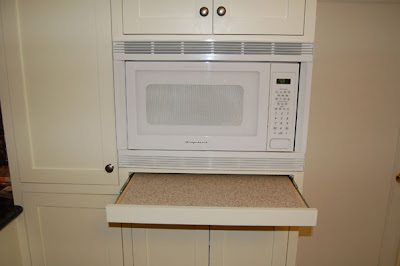 Check this out - I've been having issues with what to do with our microwave we don't have yet, since there is no space for it currently. This kitchen has it in their built in cabinet and even has a cool little shelf below it that pulls out. Love it! Well after toying with the idea of just giving them a shiny gloss and new hardware, I decided that I do want to paint them (and of course give them new hardware). I figured this out because every time I saw a nice kitchen with wood cabinets I was just not as excited as when I'd find a picture of a kitchen with painted cabinets. Our cabinets aren't the square front door type, which bothers me, but I'll live. I thought we'd be able to just buy new doors for them and make them square front but turns out they are all different sizes and that will add up quickly when it comes to having to get them custom. The other thing about the inspiration pictures above is that I don't like the white appliances. We'll do stainless probably. We need new appliances. Washing your dishes before and after they go in the dishwasher isn't the most fun thing ever. For appliances, I'm definitely thinking a gas range is a must. I love this one I've posted above, but not its price tag. I'm a budget shopper and hope to find the appliances at a good price. Any ideas on where to go for that? 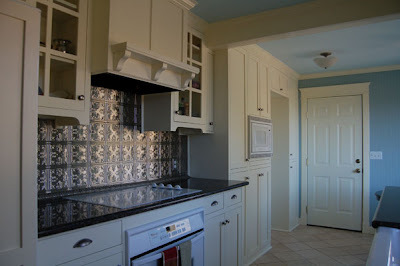 I love the tin backsplash in the California inspiration kitchen! I love the historic texture that the tin squares add...I'd thought about using those in a backsplash on on a ceiling in our house, someday.